Driving North along the Galt Ocean Mile the most northern beach front landmark is the Fountainhead Condominium. When it comes to large Fort Lauderdale Condos for Sale directly on the beach, in the current Fort Lauderdale Real Estate market , the Fountainhead represents a bargain in Fort Lauderdale Real Estate. 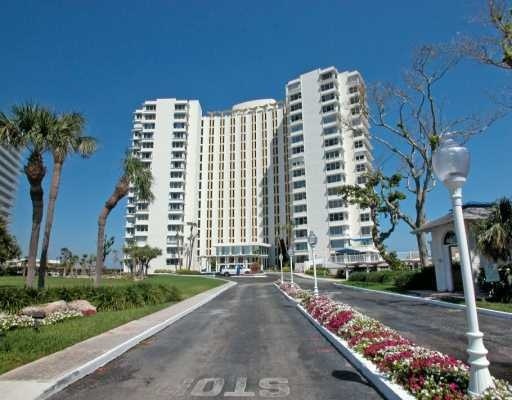 With huge ocean front condos the Fountainhead boasts incredible views of Ft Lauderdale Beach. Read more about The Fountainhead Condo. The Fountainhead stands back from the street as a landmark, with its beautiful gold bands extenting 16 stories with a huge front lawn. The Fountainhead Condominium does have an age restriction that one owner be over 55, we suggest that details of this restrcition be verified with the condominium. Foutainhead is one of the few Fort Lauderdale Condominiums that maintains an on site restaurant and rumor has it that the chef is pretty good. Many units in this building are over 2000 sq. feet so if you are looking for a large beachfront value, the Fountainhead is a great place to look. At Eric Miller and Associates, we appreciate this beautiful elegant Fort Lauderdale Condo and are ready to help with your Fountainhead Condominium purchase or sale. Contact us directly at (954) 383-8170.